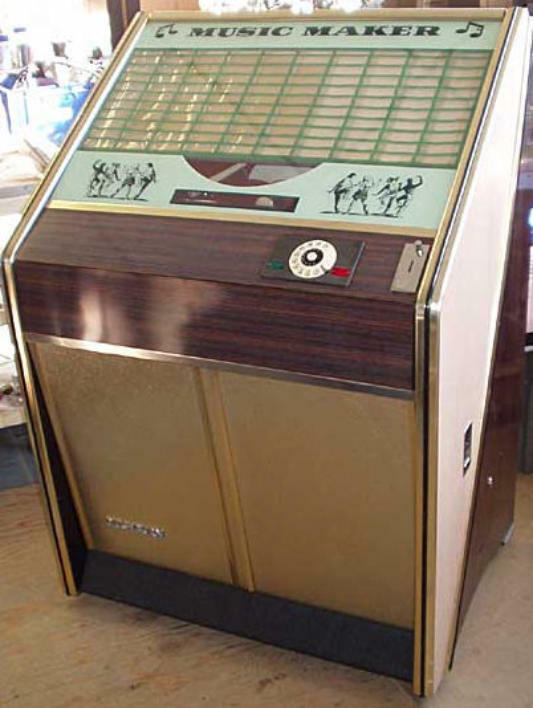 I will start with what came first in history, in 1955 we started to take the tail end of the Teleramic 100 juke boxes, these were a revelation in the music world from Germany and they were damn good engineered for life it is true the Germans knew what they were doing. 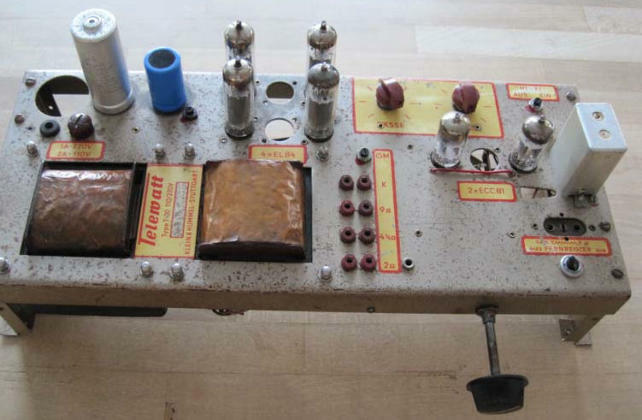 The first amplifier in the range was the Telematic T30 built by Cline and Hummel now we only had about 20 or so of these but they were pretty good especially for the bass they were heavily over corrected but that did not matter in those days I loved bass the more the better. 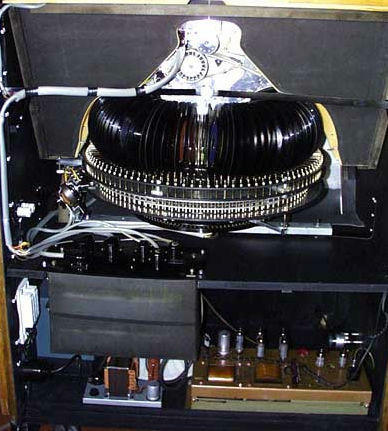 In 1957 and the advent of Telematic 200 player and then the Teleramic 200 the amplifier reverted to the T31 this also was full of bass, and used the same bias as the T30, this a was negative bias derived from one half of the HT supply. But in this ranger of juke boxes as the year went by the amplifiers changed the T32, this was the last one with variable treble and bass. And was self biased. The T33, T34, these were also self biased and they all sounded different having switched bass and treble, and they had different tonal changes on the bass and treble and more importantly the bias was self biasing that is to say the cathodes of the output valves were returned to earth via a resistor I don’t know whether this was right or not, but it saved on production cost. In 1959 we got the last of these machines and a stereo amplifier there were two amplifiers for this particular machine but the circuit was the same the smaller one I think was a T66 I had one of these I got it through a friend that went to the sale of goods when the works closed. The bass was no were as near as the earlier mono amps, maybe because these were now 15 watts per channel stereo. 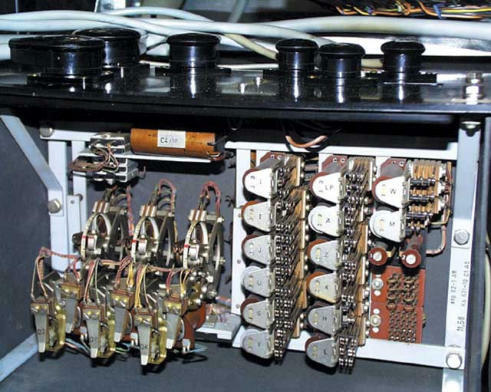 On the service side of things, the first thing you did was to change all the capacitors of the black Wyma type, you would see cracked and split coverings so you replaced the lot for Mullard capacitors, the other thing you did was replace the decoupling capacitors to the output valves. Then time to test if all sounded well OK if not find out why. If the output valves were running correctly you would see in dim light the outputs glowing blue this signifies that the valves were all pulling 48 milli-amps and running on the crest of the valves capacity, but this only happened if Mullard valves were present, we used what we could get, usually the cheaper valves “Brimar” these would run red hot on the anodes but performed the same as the Mullards. To my mind as I only worked on amplifier service for these machines you had to be a telephone engineer, why because they had their own Strowger exchange in them, it seems daft but when you look at the system you used a dial to select your record and it had to dial at a determined rate of 10 pulses a second if it was more or less you did not get anything at all so timing of the pulses were imperative. So if you know about phones or you know an old fashioned telephone engineer, he would understand and be able to fix them we had three of these engineers in the factory and bloody good they were too, Modern telephones today operate differently and use dial tones (DTMF) the new engineers might not have the knowhow to fix this old style of control. To select the record number you used a telephone dial, these were manufactured by A.T.& T American dials but made in Germany, and the speed was corrected by the bob weights. Also the relay contacts only need cleaning lightly do not use a file you will destroy the contact and timing, if you have to clean, always use a chemical cleaner spray. The engineers that serviced these machine did it methodically they never got one that came back to them. These engineers were Erick Pass, and Peter Cain. These machines were returned from sites in the early 60s and were stacking up the workshop from 1966 or thereabouts, and we could do nothing with them. The punters did not want them because they looked too old and Ditchburn did not want to scrap them because they were still far too good to scrap. Geoffrey Norman Ditchburn loved these machines. They were the first he imported from Germany when the trade embargo was lifted and they were the only machines that never needed more than a new stylus every six months and they owed him nothing. But scrapping was out of the question so he asked cabinet making companies for designs for a new cabinet to give them a new lease of life and make them look more like the modern day Wurlitzer’s. Of the three designs offered he chose one of which was modern and he set about producing the first ten cabinets in 1968, they were an immediate success. We had hit the right design at the right time so the old machines were put in new cabinets. You may or may not agree but it did give an excellent mechanism a new lease of life and made good commercial sense, they were offered for sale and quite a few were sold outright and others went for hire, not all the original cabinets were scrapped though until we sold out the company in 1972 when Gainesmead scrapped all Telematic’s in one stroke. They were the first machines to go, but at least we did give them another four years. They would still be going today, so if you have one of these machines look after it, be it in its original cabinet or in a Ditchburn cabinet they will go on for ever. I believe the Telematic’s were the best jukebox ever produced bar none especially with the T31 or T32 amplifier, they were ultra reliable and if not messed with they would go on forever. We only had one engineer that looked after the selectors of these machines, an ex post office engineer and he looked after the Telematic from import in 1957 to the scrapping in 1972, by Gainesmead. 1948 to 1950 At the end of the 40s, two friends from the area around Offenbach / Main came together after surviving the war, the technician N.A. and the merchant, with a good technical knack, W.T. The two twenty-something year old guys first develop a turntable and leave this patent. Unfortunately, the two have to drop this matter after about two and a half years. The initially good sales prices of the devices fall off rapidly and make it impossible to guarantee the livelihood. At the end of 1950 W.T. and N.A. After a long conversation, continue to work together. Here comes the idea to deal with development and construction of the first German jukeboxes. Back then, only American jukeboxes were available in local restaurants, whose purchase prices were sinfully expensive and almost un affordable. In the spacious mansard of the residential building of W.T. in Offenbach the first prototype of a jukebox is constructed and built after work and on weekends until late into the night. 1952 In the spring of 1952, the 30-year-old precision mechanic A.D. from Frankfurt to the two-man troupe. He tackles the production of the mechanical parts for the boxes. In the late autumn of 1952, the first halfway finished jukebox is ready. The mechanics are fitted in a simple wooden case (manufactured in a joinery). The name of this jukebox is "Tonomat V 102". 1953 The device is patented and presented for the first time on 10.2.1953 in an Offenbach city cafe. This is well received by some young folk but above all in the media. At the end of May 1953 it is decided to start producing the boxes independently. The Tonomat V 102 is being revised. The joinery A.P. in Offenbach. The steady increase in pit production and the associated increase in staff are leading to several relocations to larger and larger commercial premises in the surrounding area and in the city of Offenbach. At the beginning of August the first boxes go on sale - Unit price DM 3000, -. In the second half of March you register at the District Court Offenbach trade. In November 1953, mechanical engineer E.B. the leadership in the small company. 1954 A first boxing service for the region of Munich and surrounding areas is established. It is headed by a Bavarian mechanic. Meanwhile, they develop a second box and baptize them on the name "Telematic 100", which can play 50 records, which will later be increased to 100 pieces with the "Telematic 200". The Tonomat boxes will be presented successfully at some fairs Sales figures continue to increase after-sales service technicians are hired and trained in-house for their service. In the summer of 1955, a general agency is opened in Vienna. Furthermore, they also sells boxes from an English manufacturer ( Ditchburn) , with whom one has made the best contacts. 1956-1957 When the city of Offenbach advertises a new business park and offers cheap land there, the plant managers access and buy the site. There one builds a large company complex with administration, sales, assembly, etc., which is inaugurated on 30.11.1957 solemnly. The company name "Tonomat" now lights up in large lettering above the main entrance. Soon there will be a first boxing order of 1000 pieces from England (Ditchburn). In Munich, the small customer service becomes a larger agency of the company 1959 At the Frankfurt Spring Fair the latest development of Tonomat will be presented, the "Panoramic 200", a large box for a small price, but with a double capacity of 200 records. In the same year, the General Administration of the American box manufacturer "Wurlitzer", the company Husemann collapses in Cologne - a first warning! In April 1959, the company Tonomat surprisingly receives a visit from two senior managers of the American companies "Canteen" and AMI (American Musical Instruments). Half a year earlier, these companies had joined forces. Apart from boxes, these companies also built beverage and food vending machines. This large American company also wanted to establish itself in Europe and had the plan to buy the company "Tonomat" for it. The Tonomat management was initially very skeptical about this request. But the Americans did not give up. After long and tough negotiations, the final decision was made in favor of the Americans. At the end of August 1959 the company "Tonomat" changed ownership for four million DM and from now on takes over the name "Canteen Automatenbau GmbH". The three founders continue to be managing directors. The focus of production is now more and more on the production of beverage and food vending machines. Cabin assembly is becoming more and more of a byproduct. Nevertheless, a new box type is released, the "Teleramic 200". 1960 ff The takeover by "Canteen" soon turns out to be a mistake. The Americans demand too fast and highly productive production of machines and boxes that can not be implemented in Germany. The market share is reduced to almost 40%. The three German company founders are therefore detaching themselves from Canteen and taking other career paths. 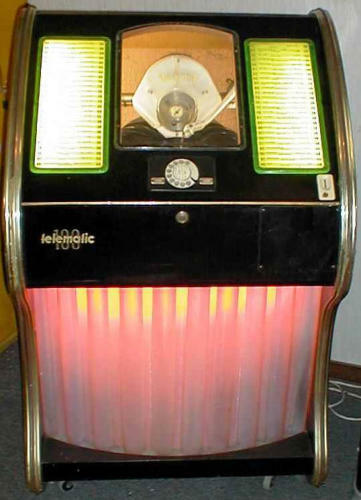 In 1963 the production of jukeboxes is completely discontinued. The dream of the three company founders was extinguished and a short, but quite successful jukebox company came to an end - unfortunately!